Migé speaks with a heavy accent, but his English is eloquent and it is easy to get caught up in his tales of touring, but what I really wanted to hear about were the grimy dives and dingy stages H.I.M. had played, the really bad places. It seemed an appropriate moment to interrupt with the news that Festival Hall in Melbourne, where H.I.M. were scheduled to perform a couple of nights later, was formerly a boxing arena. 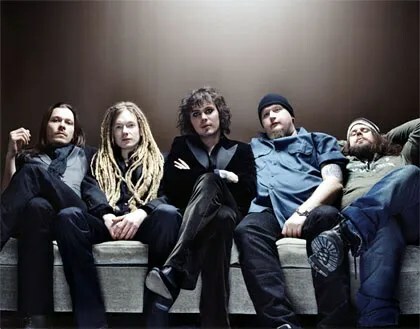 I mentioned that frontman Ville Valo seemed to be a charismatic personality live, and wondered if he presented competition for spotlight for the rest of the band. ‘Ooh, I wouldn’t say so,’ Migé dealt with this particular matter swiftly and diplomatically. ‘Maybe chicks dig Ville, and that’s a very good thing for a band. You have to have a very charismatic or exquisite front-man. Fortunately, or unfortunately.’ And, true to his word, Migé, Ville, and the rest of the band put on a show to remember. Venus Doom by H.I.M. is out now. The Digital Versatile Doom DVD is out this month. From Buzz Magazine, April 2008.